Luckily, it’s easy to be on Birbiglia’s side. The everyman’s comedian uses witty asides as spices to build his narrative-driven one-man shows Sleepwalk With Me and My Girlfriend’s Boyfriend. His current tour, Thank God For Jokes, is a series of stories and jokes about, well, jokes. 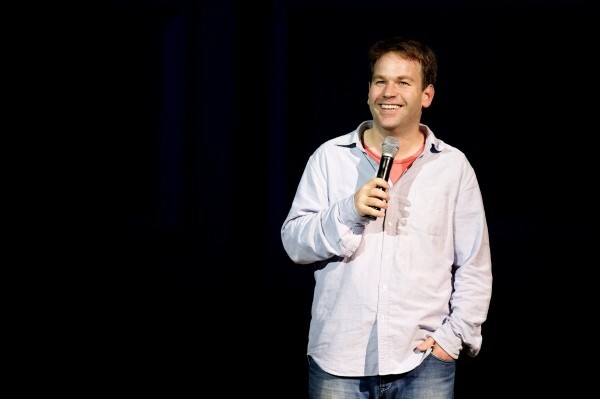 Mike Birbiglia: I think that’s true for what I do, but not for every comedian. I try to tell stories and have the jokes and the comedic bits … fill it out in a way so that you don’t even realize that you’re hearing a story. A lot of my favorite comedies are movies where every scene is like a comedy sketch, but in the end, the whole thing is adding up to this big, great truism about life. CW: So is that the goal when you write? MB: I think the goal of entertainment—the Venn diagram, if you will, of where entertainment and art intersect—is when you enjoy something so much that you inevitably take something away from it, because there’s a truth in it. It teaches you something or you learn from it, but it sneaks up on you—you don’t see it coming. That was the goal of Sleepwalk With Me and My Girlfriend’s Boyfriend, and I think that’s the long-term goal for Thank God for Jokes. CW: On the flip side, you began your career with one-liners, not stories. Based on the name, is Thank God for Jokes a return to that style? MB: I decided to return to more of the writing approach I had with [my sets] Two-Drink Mike and What I Should Have Said Was Nothing. … If it organically works into having an arc, I’d be open to that. When you look at the “Celebrity Golf Story” or the “Dennis Eckersley Story” from What I Should Have Said Was Nothing, the new tour is a lot like that. There’s six or seven epicly awkward life snapshots. … I like to say that I make an awkward situation even worse. CW: How do you write? MB: Mitch Hedberg said it best: If you want to be a comedian or a writer, you just have to write down everything that is funny to you. The easiest thing to do when you think of something funny, or something funny happens to you, is to just smile or move on. Then, you have to take your ego out of the equation. You know, I write probably 400 to 500 jokes, and maybe 50 of them stay in my act. That might even be a conservative estimate; it might be [50 out of] 1,000 jokes. Most jokes are not interesting enough to tell to people. You have to have an aggressive approach to writing stuff down, then you have to check your ego at the door. CW: Do you put yourself in awkward situations to come up with material? MB: It’s undeniable that once you’re a writer, as things are happening to you, you put them into a narrative in your head. … Comedy really is tragedy plus time. And, you know, good luck avoiding tragedy. It’s, like, unavoidable. When I was at Sundance in 2012, premiering [Sleepwalk With Me], … I was like, “I’m in show business; I’m a big shot.” My brother, Joe, said, “Let’s go skiing.” And I was like, “Sure, yeah, what could go wrong?” … I had a yard sale on the mountain: My goggles and my hat and my poles and skis were strewn across 90 yards of the slope … and I broke my shoulder. We get back to the hotel, and I knew that I had to get in the hot tub, immediately. Then, I realized my phone was in my pocket. Yeah, I know. In that moment, I realized that the comedy ain’t going anywhere. CW: Talk about being vulnerable in your writing and how that’s important for the audience, too. MB: I always try to go into the heart of darkness with all jokes—start from the place of pain and frustration and find the comedy in it. Because, you know, comedy is a coping mechanism. … Sometimes you need someone nodding along with you while you’re saying “This is insane, right?” and they just say “Yeah, it’s insane.” That’s really what you’re trying to do: Make people feel less alone and ultimately yourself, too. CW: What would your alter-ego Sleepy Carl rather be doing than this interview? MB: Sleepy Carl would rather be in a hot tub eating a calzone.